Growing up, playing board games with my sister was one of my favourite things to do. (After all, Instagram and Youtube hadn’t yet existed.) Well, one of the games on our usual rotation was Cluedo. It’s the classic mystery game of all time! The 10-year old in me loves playing Sherlock. Using the sheer power of my deductive reasoning, I could figure out who murdered Dr Black, where the crime took place and which weapon was used. There was nostalgia aplenty when I discovered the Cluedo: Spinning Detectives slot. Players can even move through the different rooms and reels! Instead of solving mysteries, we collect different jackpots and win up to 10,000x per line! The slot designers went to great lengths to create a slot as complex as its original namesake; you’ll find so many features and little treats tucked away in this game. 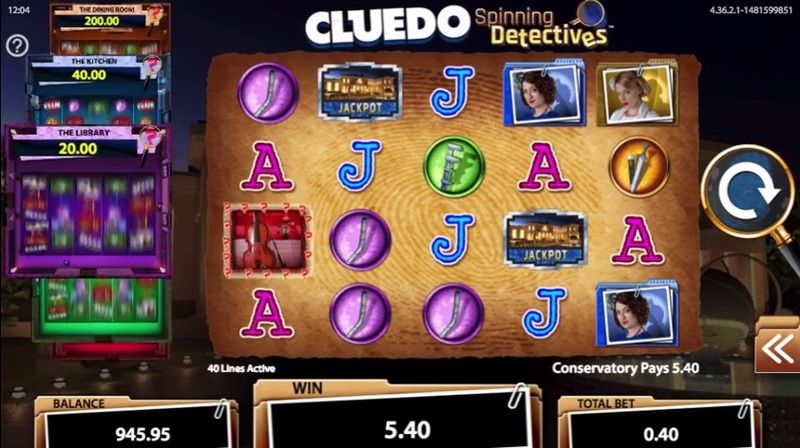 In other words, Cluedo: Spinning Detective is a slot player’s paradise! The game starts out like any regular slot, except with Cluedo-themed paraphernalia. There are five reels and 40 paylines. The most desirable symbol is the jackpot card – three of these multiply your line bet by 50 times while five in a row awards you with a stunning 500x. Then, there are the three characters – Mrs White, Mrs Peacock, and Mr Green; followed by three weapons – dagger, wrench and pipe; and finally the low-value bunch – J, Q, K and A. 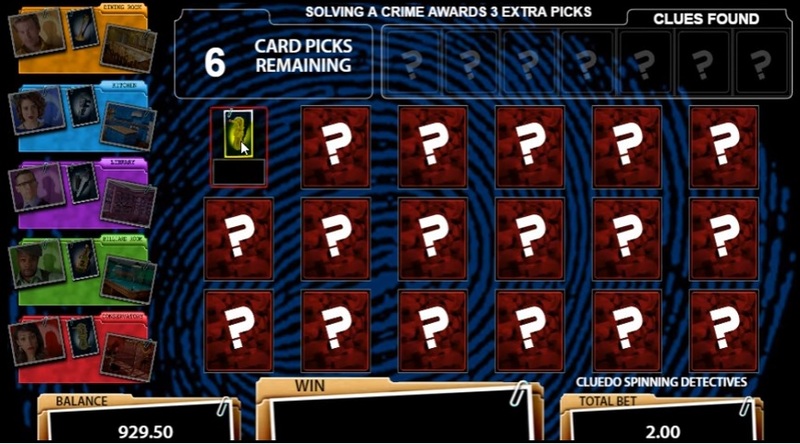 The Cluedo slot is the wild symbol in the game; it replaces all other symbols on the reel to form winning combinations. On top of that, there’s a big bunch of bonus symbols, which we’ll get to later. You could play Cluedo: Spinning Detectives with 40p to £200 per spin. Detectives/players with all manner of skill-sets/budgets can partake in this mystery. This delightful slot game has a payout percentage of 96.06%. This means that on average, £96.06 of every £100 wagered on the game is paid out to players. It’s pretty fair returns, given that we don’t need to flex a single deductive muscle to win. Cluedo: Spinning Detectives is all grown up! The designers have cast real actors and actresses to play the characters of Mrs Peacock, Mr Green and the other usual suspects. WMS Gaming evokes nostalgia through all the clever little details. For example, the win amount and your balance is displayed in little case folders along the bottom of your screen. Game Features: Stunning Interface, Extra Spins! In the original Cluedo board game, players move little character pieces around nine different crime scenes on the board. There’s the conservatory, the billiard room, the library, the kitchen, and the dining room; among few others. Well, the slot game captures this concept to the tee! Whenever one of these location symbols appear on the reels, you’ll visit the said room’s reels. and play one extra spin in the room. Each setting has a different sized jackpot and different set of features. The conservatory: Mrs White, Mrs Peacock and Mr Green are replaced by Gold framed versions, which pay even when mixed on a payline. The room hosts a tiny jackpot, only 10x your bet. The billiard room: Five billiard balls in different colours spread out across the reels. These balls act as wilds symbols. The billiard room holds a jackpot worth 25x your bet. The library: A magical book moves across the reels, transforming one or two reels fully wild in its wake. The library’s jackpot is worth 50x your bet. The kitchen: Watch out for the knives! Two to fifteen Knife wilds are flung onto the board and land randomly all across the screen. The kitchen carries a 100x jackpot. The dining room: Anywhere between two to five reels becomes completely wild with flasks of poison! The dining room is the most lucrative setting of all, with a jackpot worth 500x your bet. You’ll find little magnifying glass icons tacked onto the top-right corner of the symbols. They can appear at random times and at random positions. Five magnifying glasses awards the room jackpot! You’ll be surprised how often this actually happens. If you reveal three cards of the same colour, you’ll get three additional picks. If no colour groups are matched but you’ve already collected two of the three suspect, weapon and room cards, you’ll get a last chance pick. Finally, there are extra spins! (Because which slot is worth playing if there are no extra spins?) In this game, three scatter symbols (the Mansion) gets you seven extra spins. You will begin on the Conservatory room set. It’s the least profitable room, but you’ll have lots of chances to advance to the next room. Look out for the Envelope wild to do this! In addition, you’ll also get additional extra spins with this envelope symbol. However, don’t get too carried away by all the action. Not every little feature brings the dough. Some are merely designed to keep you engaged and playing for longer. The extra spins were brilliant, but the Spinning Detective much less so. 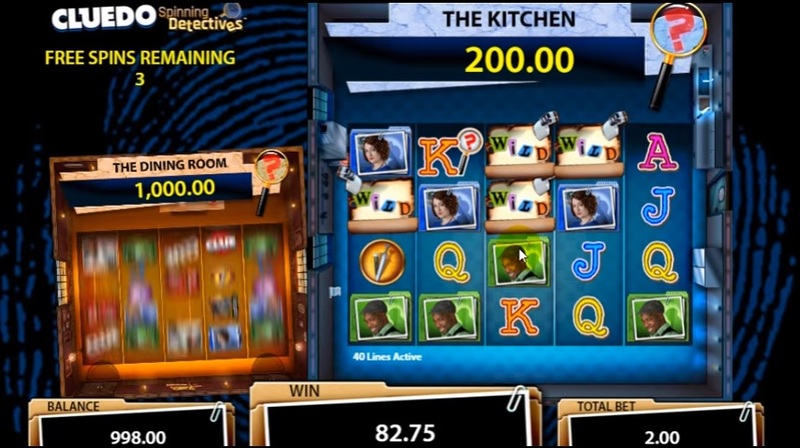 Clue: Spinning Detectives isn’t the first board game-themed slot produced by Scientific Gaming Interactive’s WMS studio. The same gaming studio has also brought Monopoly to life, as well as America’s favourite variety show – The Price is Right. These games immediately capture the hearts of millions, leveraging the original brand’s immense fan bases. Cluedo has been around since 1949, so you can imagine how many kids grew up with the game! All of the titles are well adapted for the slot format too, so you can enjoy classic elements along with the thrill of slots. In Epic Monopoly II, you get to move around the board, collect multipliers instead of rent and open Community Chests! Want to play Cluedo Spinning Detectives? Cluedo Spinning Detectives mobile slot is a timeless classic slot that will bring joy to you no matter how long you play it. Claim 200 extra spins now! Cluedo Spinning Detectives How do I love Cluedo? Let me count the ways... I love the frequent free re-spins whenever I get a location card. I love the extra spins because that’s when the real big bucks hit the bank. The room jackpots were brilliant as well, and always boosted my casino wallet. I love how closely the slot game kept to the original plot; the clever slot adaptations, little details and all. I appreciated how many different features were created; these kept me entertained for a long time! PreviousBGO Vegas Casino Review — 20 No Deposit Extra Spins!